LED Daytime Running Lights have come about as great safety equipment. They make it easier for the vehicles to be seen from a greater distance, thereby reducing chances of accidents to a greater extent. In an age where LED DRLs are being provided as standard equipment on most premium motorcycles, here is one way to upgrade your older motorcycle to house LED DRLs in a stylish way. 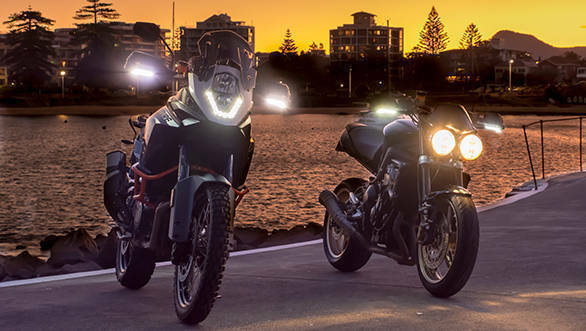 The Australian motorcycling accessories manufacturer Barkbusters has launched auxiliary LED lights which can be mounted on its hand guards as either white running lights or amber turn signals. The LED lights can be mounted on Barkbusters' JET, VPS and STORM handguard designs, which will have to be purchased separately. The lights are sold in pairs, each consisting of 15 small LEDs. Barkbusters also offers an optional resistor to correct the indicator flash rate, if needed. 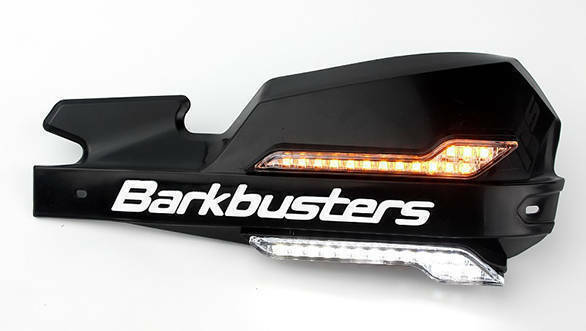 Barkbusters' LEDs use just 0.4amp per indicator light and 0.2amp per running light, resulting in a lower load on the electricals of the motorcycle. The LED DRLs and amber turn indicators can be bought for Rs 4,810 each and the LED 10 Ohm resistor for Rs 1,150 on bigbadbikes.com.